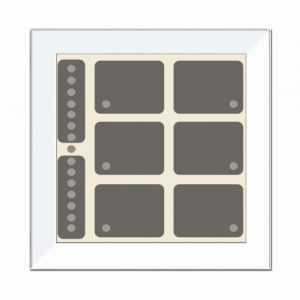 The LCN-GTS8 is a sensor-touch panel with a bargraph display. It is connected to the mounting panel and a standard double flush mounted wall-box and firmly fixed with 2 sliding hooks. It connects to the T-port of any LCN Moduls as of version 1706…The integrated temperature sensor supplies the measured values with a triggering from 0,1°C, and thanks to its adaptive average calculation, practically noiseless. The 8 capacitive working sensor surfaces are located behind a 5mm (3mm) glass front. A light touch of the glass front is all that is needed to trigger the different functions. A status LED which is integrated in every sensor reports on the current status of any actuator or sensor in the building with 4 indicator modes. Corona® surrounding light with white LEDs serves as a decorative wall light (LCN-NUI required) and can be switched as a decent orientation light, so that the LCN-GTS8 (LCN-GTS8) can also be operated in darkness. An external power supply is needed when operating the key background LEDs and the Corona® surrounding light. Please order the LCN-NUI separately. The individual labels for the LCN-GTS8 are printed on foil/membrane or paper, and fitted behind the glass front through a small slot. The labelling can be changed at anytime so that changes to the key functions do not create a problem. Easy to understand symbols and templates come delivered with the LCN-GTS8.